Yelp is not as well known in New England as it is in other parts of the US. Yelp’s business practices are hurting many businesses, especially small businesses, and they are being called into question. Currently, there are many lawsuits and petitions calling for Yelp to change. Here is my experience with Yelp. 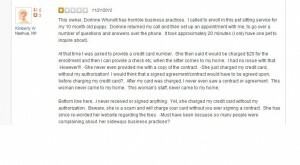 July 2011 – The phone rings and it is a wonderful client, who tells me there is a negative review about my company and did I know…..She told me it was on Yelp. Yelp?? What is Yelp? Never heard of Yelp. So, I go on and sure enough, there is a negative review from a Paul. His review was trashing all of my policies and procedures. Why was this person who never used my company trashing us?? 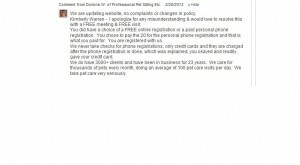 Well, after doing some research, I was informed he was a competitor pet sitting company!!! So this is how I was introduced to Yelp about 1.5 years ago. Since then, I have learned more about Yelp than I ever wanted to know. Yelp is a business. Yelp makes money selling paid advertisements. Yelp gets people to see those paid advertisements with reviews about businesses the public posts, good or bad. Yelp uses human psychology to their advantage to make more money. Yelp knows that most people will click through to read a negative review more often than a positive review. Therefore, the paid advertisements on these pages will be seen more. So Yelp LOVES negative reviews. Supposedly, a negative review will have a better chance to stay on a business’s main public review page than a good one. What does that mean…..well Yelp has a filtering system. Yelp claims that this filtering system weeds out a competitors review, a review that a business may have paid for, or a review that the business wrote about itself…Yelp claims that with this filtering system it gives a more accurate reviewing process the public can trust. Hmmmmm, really?? 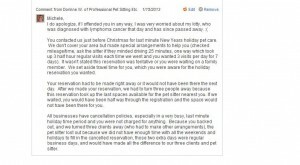 It did not filter my competitors negative review…..Yelp deals with those complaints by stating their filter is not 100%….. Okay, so my client who originally found me and told me about Yelp, decided to write a wonderful 5 star review. GREAT. Well, it disappeared??? Where did it go? It was filtered!!! So, Yelp keeps the negative competitor review and filters/hides the positive legitimate client review??? Filtered reviews are hidden from the public unless you know to click on the very faint (filtered) on the bottom of the review page. BTW-anyone on a smart phone Yelp mobile app, does not even have a choice to see filtered. Filtered reviews are not counted toward the business’s overall star rating, so my company that has been in business for 23+ years, who has done over a quarter of a million pet care visits, helped 3000+ happy satisfied clients and given wonderful service has a 1 star Yelp rating (today it has grown to a huge 2.5 star rating- Whippee!!). When I wrote to Yelp, asking them why this review was filtered, they returned my first email with information on their filtering process. 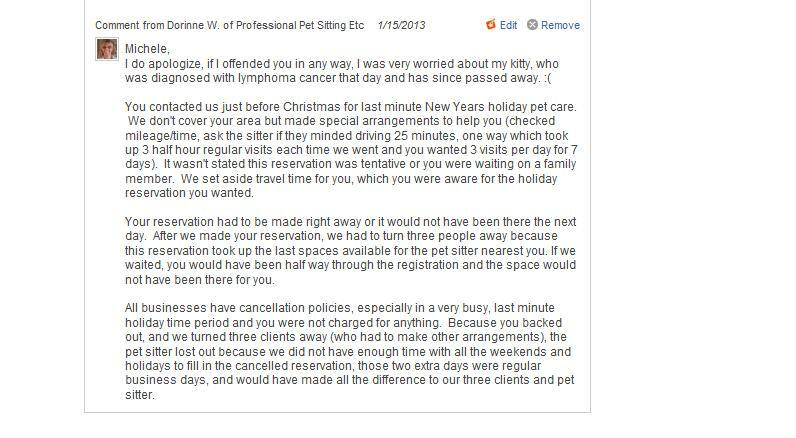 I replied back, that this was a client, a legitimate client and that this review should be seen. I was told that once a review is in filter it cannot be removed. After a few more emails, I was then told to tell the reviewer to keep writing reviews, over time after they have written many reviews, it was possible for that review to come out of being filtered……So, which is it? Once a review is in filter it never comes out or over time and after writing many reviews, it will come out…. As you can see above, we currently have 15 filtered reviews as of February 22, 2013!! Which if all these reviews were seen by the public and counted toward our overall star rating; we would be a 5 star company!! This is what we are! Before the above review was written, I receive a call from Yelp. Why? They want me to pay for advertising!!! I told them, why would I want to pay for advertising to bring more people to see a negative review and a 1 star rating for my company? That would be an utter waste of money. I guess that was the wrong thing to tell Yelp because apparently, if you do not advertise with Yelp, the business is destined to have most, if not all, positive reviews filtered and this is certainly true in my case. Try Googling Yelp-extortion and see all the lawsuits! Over the past year or so, a few clients have found me on Yelp, they have written some of the most wonderful reviews, all (except one), have disappeared into the filter, hidden from the public. These wonderful clients took time to tell the world how pleased they were with our company. For that I am touched and grateful but I am also OUTRAGED at Yelp. Yelp has literally silenced these people. They have expressed their anger, hurt, helplessness and unfairness at Yelp. Yelp has not responded or just tells them their filtering is not 100%. The only exception to the rule is my great client Brenda (she wrote the above review and has recently moved away to Ohio, We miss you). She has embraced reviewing, trying to let the public know of all the great places she has been and companies she has used. She has racked up over 100 reviews and is known as a Yelp Elite Reviewer (look by her picture above, you will see elite and the number 149, that’s how many reviews she has done). 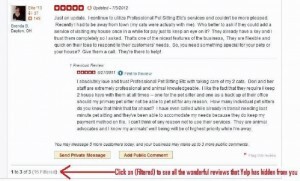 The Yelp Elite positive reviews have a better chance of being seen and not end up being filtered. Thank you Brenda, for your great review, the only positive review counted by Yelp. The first reviews Brenda wrote, were filtered. The above review was her third and fourth attempts. As I learn more about Yelp, searching online for articles and Facebook etc, I find that the businesses who pay for advertising seem to have a better attitude about Yelp because their positive reviews are kept. The businesses who either cannot afford Yelp advertising or choose not to advertise are the ones who seem to have the problem with most or all of their positive reviews placed in filter (in my research, I’ve read many businesses were forced out of business because of the public seeing only the negative Yelp reviews). If you are a small business and find that not to be true, just wait. I had a friend who was thrilled with Yelp, she had 6 great 5 star reviews, she said I was wrong; Yelp is great, getting clients, etc. Yelp called her for advertising; it just wasn’t in her budget. Within the next 2 weeks all of the positive reviews were filtered and now she has ZERO star rating!! So, why don’t I just remove my company from Yelp?? I tried. I wish I could. Yelp claims that my company information is public domain and it will not be removed from their site. So, my Company is held hostage. If you search, you will find many who have filed lawsuits. Unfortunately, Yelp has a lot of money and so far, they have won or have settled and it has not been made public. I tried to add to my business information on Yelp, to tell people to click on Filtered. The next day, it was gone, Yelp had removed it. Apparently, if you write anything that Yelp does not approve of, especially if it is about Yelp, they will remove it! In the midst of all this, I received an email from Yelp stating they were holding an online seminar. Well, I thought, maybe if I learned more about how Yelp works – maybe, just maybe, I can turn this negative into a positive….I learned that one of Yelp’s guidelines, is a person must have used my services in order to write a review. Well, the one negative review from Paul (the competitor), spoke about how he disagreed with my policies and procedures, not once did it say anything about how he used my services. I wrote to Yelp three times, stating what I learned and they did finally remove it. WOW, a step in the right direction. Keep in mind that I wrote to Yelp a dozen times before, telling them, this was a competitor and that he did not use my business but until I specifically pointed out their guidelines, they did nothing. What happened next was very discouraging. 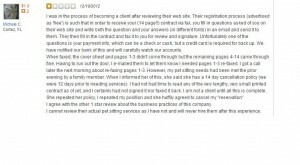 We received 2 additional negative reviews on Yelp within a month or so of each other, from people who seemed to want to use our service but never finished their files, Kim and Michele. 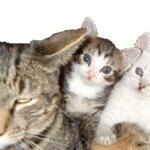 Keep in mind; we do 10,000-20,000 pet sitting visits per year. We have over 3000 clients, so 2 negative reviews shouldn’t bother me, right? But it does. We all work very hard and we strive to be the best. We have an A+ Better Business Bureau rating; have been awarded Pet Sitting Company of the Year, along with a very long list of credentials as well as numerous amazing testimonials. These negative reviews (without seeing the filtered positive reviews) skew the good loving care that we provide as a whole, to many pets for the past 23+ years. Our business is based on trust, trust with the care of your beloved pets, keys to your home, etc. We value that trust highly. If a person has ANY doubt, why would they take a chance? I spoke with the first reviewer, Kim, on the phone answered all of her questions. She decided she wanted to register. I told her she had a choice to do the Free online registration or a personal phone registration for $20 that will be charged to her credit card. She opted for the personalized phone registration for $20. She made an appointment with my Office Manager. At the beginning of the phone registration, our office manager asked Kim for her credit card info and told her, it was a one time charge for the phone registration. Kim gave her full credit card number, expiration date, 3 digit code and exact name on the card. Please keep in mind that we have phone scripts that my Office Manager and myself, follow word for word so we do not leave out anything important and we tell everyone the same information. Kim was even told at the beginning that she, my office manager, would be following a script and to please bear with her, she didn’t want to leave anything out. Our registration is very thorough to ensure we know everything we can, to take as good of care of your pets as we can possibly do. Most of the people we speak with love our thoroughness. 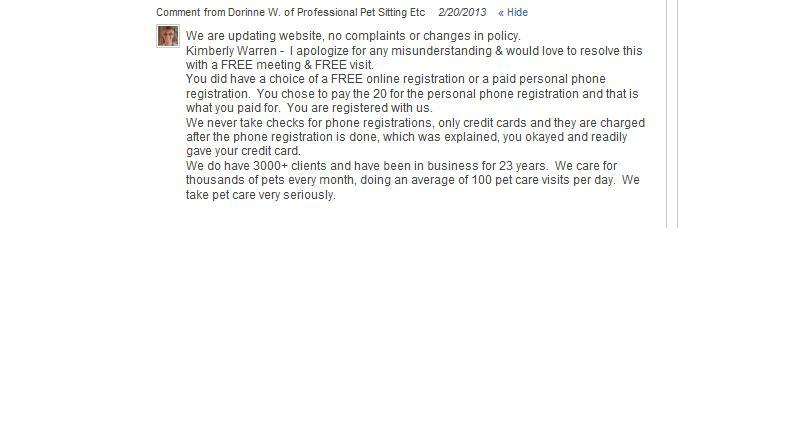 It does include the 6 actual pages of our registration (vet releases, emergency information, service agreement, and pet care) and the rest is a client reference guide with lots of helpful ideas to get the most out of our great service as well as our fee sheet. My office manager spent an hour (it did not take 20 minutes as Kim later stated) taking down all of Kim’s information, answering questions, and listening to Kim’s stories about her dog. We understand that no pet owner can resist talking about their pets, telling funny stories and letting us know all about their personalities, (plus its fun for us to hear as well). After Kim left this, I was shocked; I tried to leave a reply (seen below). But Yelp wouldn’t let me until I first uploaded a clear picture of my face (yes, that it was it told me)!! My picture was rejected TEN times because I wear glasses. Finally, one went through. However, as you can see with Kim above, it is not required. The reviewer does NOT have to be so forthcoming. They can leave it blank or post a picture of anything. Michele was thrilled. We rushed to get her all set up, Michele was to go online for our free registration, and I put her reservation on the sitter’s schedule to make sure that we could cover her. This was a reservation that would take up 3 half hour slots for each visit to enable the sitter to have enough time to drive and care for the pets. We received Michele’s information, filled out and faxed the forms; everything was all set to go. All we needed was the signed forms to be faxed back that night. The next morning, December 20th, there were no faxed signed forms. Time was running out and we would soon be closed for the long Christmas holiday weekend. Next week was the holiday week, we would only be open for Wednesday/Thursday and we were extremely busy. We called to see if she was having trouble faxing. We were told that her niece would be caring for her pets and she wanted to cancel. According to Michele, she wrote in her review I was “huffy”. I do not think I was anything but professional on the phone. If I wasn’t, I definitely apologize. I did mention that we do have a 14 day cancellation notice (especially for holiday reservations). This cancellation notice was on the registration questionnaire as she was answering all the registration questions, it was on the reservation sheet that was faxed to her and it was on our website under FAQs. However, I did not tell her verbally before she did the registration. As I spoke with Michele on the phone, she went on to say that I should not have scheduled her, she never signed anything, however, she further stated she did want to use our services in the future!!! The next thing I know, she has written a horrible review on Yelp, stating that I was huffy to her and that she called her bank to make sure I didn’t charge her credit card!! 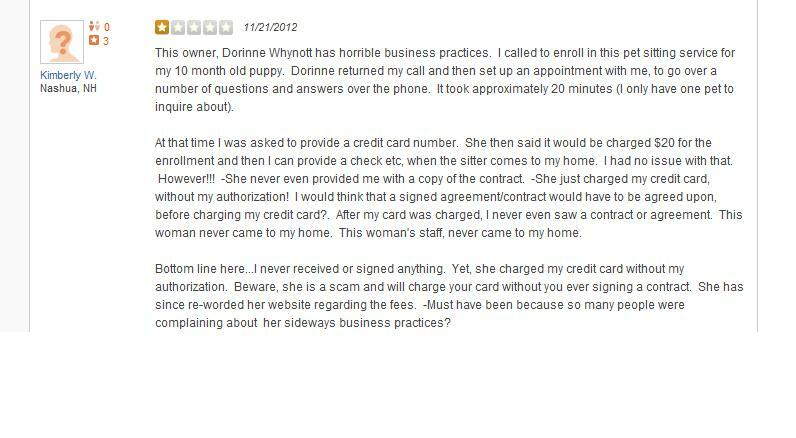 (We didn’t charge her credit card, not even a cancellation fee). Our registration process does clearly state to clients that as soon as we receive their information, they are registered clients. Both Kim and Michele are registered clients (whether they fax signed forms back or not, they just needed to send signed forms back to us to finish their files, which legally allow us to enter their homes to care for their pets when needed). Soon, our registration will be expedited with our online Program (hopefully ready in March 2013), and then everything will be done directly on our website (no more faxing!). Clients will be able to make their reservations and payments online themselves. I can’t wait!! I felt so awful for the clients that we had to turn away, when we could’ve helped. I felt even worse for our sitter who selflessly tried to help her (as we all did) and lost out on 3 visits (1.5 hours) three times a day for 7 days ! That was a total of 63 pet care HOLIDAY visits that she and our company lost out on. We had no choice but to place Michele on our schedule as soon as we promised we would help her. If we didn’t, then while Michele was in the process of doing her paperwork, we would have filled in those slots with the 3 clients who called in, and we wouldn’t be able to cover her after we told her we could !! Michele did not state that this reservation was tentative, or that she was looking into her niece helping. We were told that we were her only option. I did try to resolve both cases, but neither returned my calls or emails. After this happened, I tried another Yelp webinar, this time on Yelp Deals and Gift Certificates. I learned if I offered these through Yelp (Yelp would make 10-25% of whatever I sold), that when a person purchased them and redeemed them for my services, the next time a person went on Yelp, they would be asked to write a review!! Okay, that sounds good. I know we have great service, so, I signed up. In the next 5 weeks, 4 people purchased a deal/gift certificate. After they were redeemed, I ask these 4 people if they were asked to write a review, they stated no. So, they decided to go on Yelp and write a review anyway (Joyce, Brad, Elizabeth and Pat). Each had purchased a gift certificate through Yelp (Yelp made money on my Gift Certificates), and each had redeemed it to use our services. They should be considered legitimate reviewers for our services, right?? All four reviews were immediately placed in Yelp’s filter. Joyce couldn’t believe it and thought she had done something wrong. So, she deleted her review and did it again- But same thing, in the filter it went. Elizabeth said she worked in computers and understood about filters, not to worry, but hers was filtered too and she couldn’t understand why. Brad was just angry. 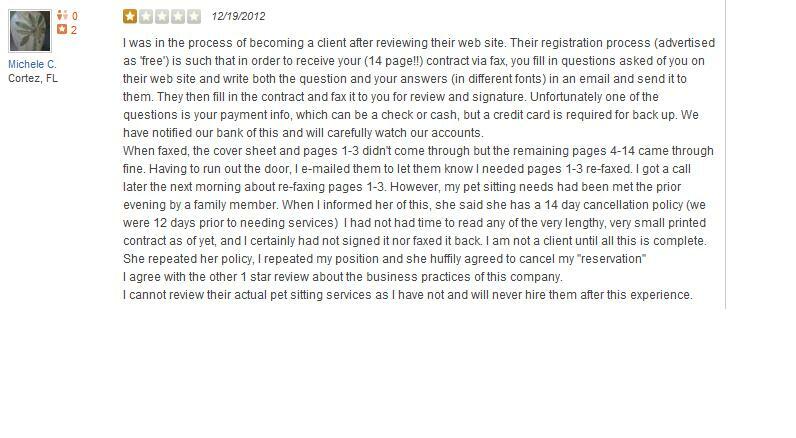 Pat was so upset; she wrote to Yelp but received no response except information on their filtering process. She was angry that her voice was silenced, so unconstitutional !! So, Pat removed her review all together (she was going to try to write as many reviews as she can over time and try to become an elite, come back and write a review that will stay). Soon after, Yelp had another webinar on Yelp Deals and Gift Certificates. I wanted to ask why these people had not been asked to write a review and why were they filtered. Of course we can only write in our questions. As I was listening, I realized that things had changed (the last webinar was just a month ago). They took out the part where after redeemed, people would be asked to write a review. So I wrote in my question – Yelp’s response…..We like reviews to happen organically……Organically??? What does that even mean? It couldn’t have happened more organically then it did. Here are more of our filtered reviews, if you would like to read them. Why give Yelp the traffic when you can read them here. Plus Yelp has made it more difficult for you to see the filtered reviews by adding “Captcha”. Sometimes you need to put in those annoying, hard to read codes more than once. However, feel free to check them out online if you wish, just remember to please click on the filtered to get the whole picture, not just Yelp’s view of what they want you to see. So, should you believe every Yelp review? That is up to you. We know our company and we work VERY hard to give every one of the beloved pets in our care the best service we can possibly provide for the past 23 years. We have pet sitters that have been in our company for an average of 3 – 13 years, that’s longer than most pet sitting companies have been in business. Again, I repeat, we do 10,000-20,000 pet sitting visits per year. In 23+ years, we have racked up over a quarter of a million pet care visits!! We have over 3000 clients, so 2 negative reviews shouldn’t bother me, right? But it really does. We (my petsitters and I) all work very hard and we strive to be the best. I guess it wouldn’t be so bad if you, the public, were given the ability to see the whole picture and not a skewed version of what Yelp wants you to see. This skewed version has hurt my business, which not only affects me, the owner; it affects all of my employees and clients. If we lose money, we cannot improve our business to offer more to our clients and sitters. Every month Yelp sends me a report of the number of people who has seen these 3 public reviews (1 positive from Brenda and the 2 negative). In November we had 14 people see those reviews, in December, 16. Every new client is asked where they heard about us and NONE have said Yelp. We lost 30 potential clients in 2 months. 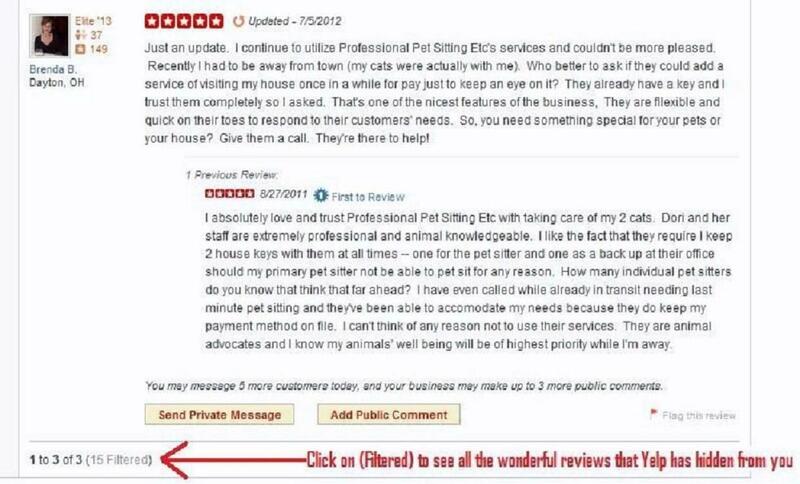 In my opinion, those potential clients did not know to click on filtered to see ALL the reviews to enable them to make an informed decision about a great pet care company. So, yes, this bothers me. It outrages me and it hurts all of you. I don’t know about you, but when I am looking up reviews for a product or business, I like to read ALL reviews. I WANT to read all reviews, good and bad. For me, this helps to get a full picture of a product or business. As a whole, it helps to put everything into perspective so I can make an informed decision that is right for me. Generally, when reading all reviews, it is easy to pick out the reviews that are rants, or not helpful as long as you can read all of them. Yelp takes away your ability to read ALL reviews (unless you know to click on filtered but why should you have to). Yelp takes away your ability to make an informed decision when you have all of the information, not the information that Yelp chooses for you. Does Yelp believe that you do not have the ability to make an informed decision with all the reviews available to you? Yelp takes away your rights, your right to be heard, and your right to voice your opinion. Yelp silences and takes away your freedom of speech. Yelp takes your constitutional right away. Who are they to tell us what we can read or write? Yelp hurts good small businesses. For my business, my amazing clients and many of the people and businesses in the same boat; Yelp is not a trusted company for an unbiased place to find reviews, in my opinion. Is it in yours? If you would like more, just Google Yelp Lawsuits, Yelp extortion, etc. Did you know that Yelp filtered reviews? Did you know that many lawsuits have been filed against them? Do you agree that Yelp should have the choice to filter you review?